?-????? | ??? ?????????? ???????? ???? An Obstacle Course Race, challenging the very mind, body and soul of every athlete in pursuing the quest to be the champion. In addition, X-Quest includes the adaptation of the ever-popular Indonesian people’s obstacle game held annually during the National Independent’s Day such as the ‘Panjat Pinang’ and the ‘Traditional Sack Race’ giving it the Indonesian flair and characteristics but yet fulfilling the international OCR standards and expectations. A combination of intelligence, strength and agility is required where the challengers have to combine all these three aspects to win the 15km of challenging obstacle course. Challenging obstacles included are climbing over walls, carrying heavy objects, traversing bodies of water, crawling under barbed wire, and jumping through fire. Several obstacles are similar to those used in military training, while others are unique to obstacle racing and are employed throughout the course to test endurance strength, speed and, dexterity. 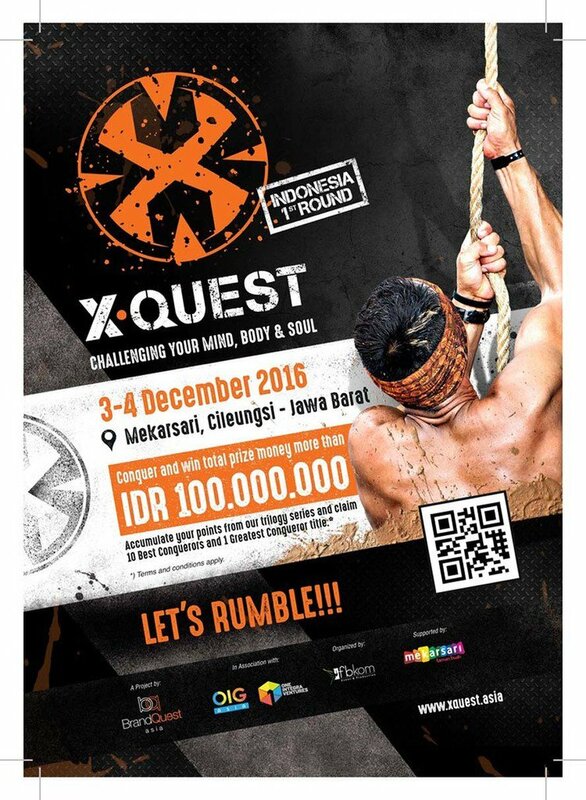 X-Quest challenge involves a trilogy of 3 rounds held independently every 4 months consecutively. Winners from each round will receive points, rewards and other prizes as Round Winners. Accumulate points from all 3 rounds of our trilogy series and stand to claim the Best 10 Conquerors and 1 Greatest Conqueror title. There will be two levels of challenging courses offered; there are the Extreme and Novice categories. Each race category varies in distance and challenge levels. The race will be divided into waves of groups between 300 to 500 athletes each time. The Extreme level is not for the weak, it challenges the determinations of athletes who dare and conquers the strenuous course that lies ahead of them with the true spirit of a champion. The Novice level is for those who want to taste and endure the challenging course in a more relaxing and fun manner and to eventually progresses to the ultimate Extreme challenges.